I've said this before, but we are really turning a corner these days and boy oh boy is it a beautiful, beautiful thing. I say this because we played on the floor today and you were happy for more than five minutes! 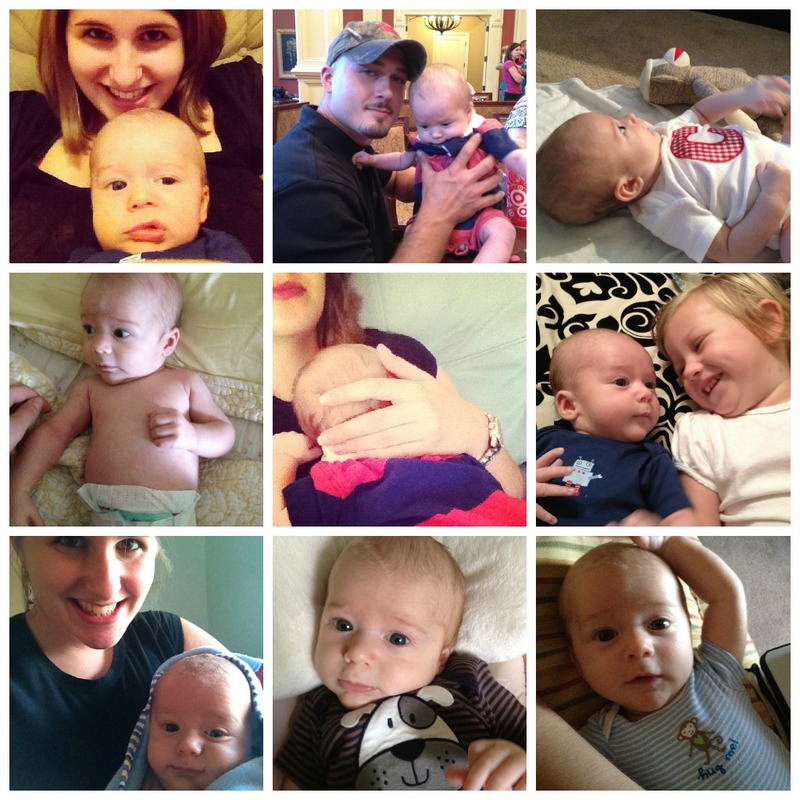 This week was a dreaded week for us, turning two months on Saturday (9/8) meant two month shots on Monday (9/10). You made mama proud, only screaming while it was happening and then settling down just as soon as I scooped you up. Your body tolerated them well and we haven't seen any difference in you whatsoever (knock on wood). I was really concerned about you having a reaction to them and have been watching you like a hawk. With turning nine weeks old we have been getting really serious about tummy time, napping, outside time, and a reasonable bedtime. We still don't have any set routine besides a walk around seven each night and following it with bath time around eight. You seem to be ready to get up and out of the bed around nine each morning and will usually sleep in your bed beside me each night for about four hours before waking up to nurse and then usually staying in the big bed with me for the rest of the night. In all honesty, I'm sure you would sleep in your bed again after eating but I'm usually so exhausted that we both lay down while you eat and just end up staying like that. I really need to start working on that, I know. On September 7th you began to notice your hands and were staring at them for quite a while and then would clasp them together and pull them apart and repeat, again and again. Today, September 11th, you noticed the television for the first time while we were playing on the floor with your new friend Mr. Socks (the sock monkey). You had your eyes fixed on the television for a solid three to four minutes before getting bored and looking around for mama. Back to our walks... you're not really a big fan of them yet and I think it's because you can see me and don't understand why I'm not holding you. You will usually be content for fifteen minutes and then you start to cry. I'm really hoping you'll come around on this because going on walks to beneficial for both of us! We walk around our apartment complex and then we walk up and down the many hills in the cemetery down the street visiting all of the graves of the loved ones we've lost. It's a beautiful cemetery and not creepy at all! You LOVE to spend time on your changing table (still), your baths, bouncing on the yoga ball, sitting straight up, sleeping on my chest, eating and just being on "the go" in general. Before you fall asleep in the car, if we have to stop for a red light you immediately begin crying and then as soon as we start moving again you are fine. Besides your car naps, I get you to sleep by bouncing the rest of the time. You love to bounce (I feel the need to say this again!) and my legs didn't at first, but are slowly adapting! You can still fit in all of your newborn clothes but I am putting you in more 0-3 month outfits. You went through a phase a couple of weeks ago where you would only have a BM every three days, it was terrible because when you did go it was MESSY. I am happy to say that we are back to about once a day again. I love my days with you. They are slowly getting easier which makes me love them even more. I feel this incredible bond, something I've never experienced before, and it is amazing. I love that you are always looking around for me if I'm not holding you. I love how you stare right into my eyes when you're eating. I love that you take perfect pictures when I take them with my phone, you seem to look right into the camera. I love that you seem to love me as much as I love you. You are TEN pounds 4.5 ounces! You are 23 inches long! You are in the 18th percentile for weight and the 51 for height! You are PERFECT, said the Doc.! I already knew this, of course! Being your mom is, hands down, the best. You are the best. I can't believe two months have passed already. I want to cry when I think about it but then I think about all of the great times and new experiences to come. It's all so emotional, this motherhood thing.